Radical Acceptance involves fully committing to love someone and his flaws, or deciding that it is time to let go and to, ultimately, dump him. It’s not necessarily bad: Breaking up can be a blessing if you are not ready to love all of the other person. But how do you know? Here are three guidelines for determining your next move. 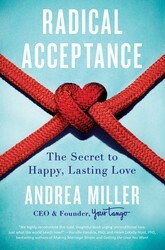 Read more in Radical Acceptance: The Secret to Happy, Lasting Love. First, there is no standard length of time you must be together after which you must decide to love him or dump him. You should know this person well and have ideally gone through some ups and downs together. If you’ve been dating a handful of months and aren’t sure, by all means, keep dating, have fun and don’t feel pressured to make this decision prematurely. However, if you have been together for years (whether married or dating) and you feel uncertain whether you can make this level of commitment and really mean it, I urge you to really be honest with yourself and with him. Either decide to just love him and make peace with the annoyances or terminate the relationship. There is no standard length of time you must be together after which you must decide to love him or dump him. This leads me to my second point. Making this decision comes down to trust. You must trust yourself, and you must trust him. I have written this book to help you understand yourself and your relationship better, and to more confidently make crucial decisions about your life. By reading others’ stories and taking these insights to heart, you’ll have a strong framework for objectively assessing your relationship. The rest is up to you. No one can or should make the decision for you. And, finally point number three: the decision to make a definitive yes should energize you. If you feel fatigued or disappointed, then you probably should say no. Say it decisively. Being in limbo is no-man’s-land. It’s a dangerous place to be in a relationship. Did you decide to keep him? These 5 mantras will help you continue to build intimacy. Did you decide to dump him? These tips will help you avoid internet dating burn out.